Decoy - BUY THIS DVD! Complete for the first time on DVD, we bring you the ground-breaking police drama...Decoy! Based on a variety of factual cases tackling controversial subjects, the Decoy series was a significant marker in television history, undeniably ahead of its time. Initially aired on October 14,1957, it was the first show to film on location in New York City and the first to feature a policewoman as its main character. The series also had high production value in terms of its film noir look and fully developed characters. The talented and stunning Beverly Garland steals the show as the no-nonsense and uncompromising female crime fighter, Casey Jones, sharing the screen with a variety of up-and-coming talent such as Peter Falk, Larry Hagman, Martin Balsam, and Suzanne Pleshette. The stories are presented in a style much like the popular TV police drama series, Dragnet, but from a more compassionate point of view. Casey Jones narrates and, at the end of every episode, breaks the fourth wall and talks directly to the audience, often sharing how the case affected her. She does not have a regular partner and is assigned to a different department every week whether in uniform, undercover, or as the officer in charge. Working on any type of crime and in any area of the city, she is respected by her fellow male officers who appear to accept a policewoman as standard. 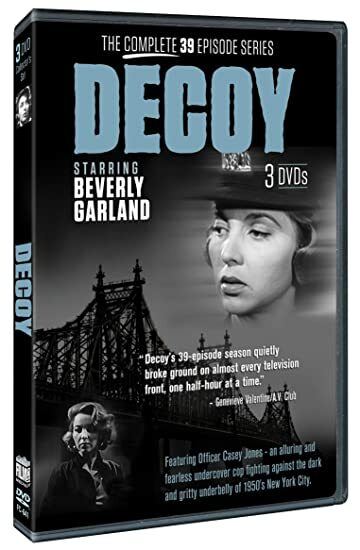 In its all-too-brief run, Decoy contained an assortment of routine sensibility as well as captivating psychological drama that directly influenced later crime drama shows like Police Woman (1974), and would remain an archetype for crime drama shows that followed decades later. Decoy was (and still is) dedicated to the NYC Bureau of Policewomen / Policewoman's Endowment Association.